Could you help support West of England Mentoring on National Mentoring Day? West of England Mentoring (WEM) provide positive volunteer mentors from local organisations to help students aged 12-15 raise aspirations, follow their interests and make plans for the world of work. WEM delivers national best practice in business mentoring to students across the region and Ablaze is a lead partner in WEM. 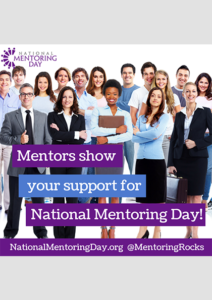 To recognise National Mentoring Day, we are asking you to hold a dress down day or a cake sale Friday 26th October 2018 (or any following Friday to suit) – suggested donation £1 per person / slice. West of England Mentoring relies on donations in order to provide unique mentoring experiences to young people across the region – your support is gratefully received. If you would like to find out more about WEM please contact us.